Since writing my last 'six good things' post, things have started to look up for me in a few ways. I'm really happy right now, things just seem to be going great and after such a rubbish end to last year it feels like it's been a long time coming. I feel so much better about myself, about the future and about things to come. The only bad thing going on right now is that my laptop has broken, which is why I haven't been as active as usual on here and my social media channels, but fingers crossed that will all be fixed soon. Blogging events are something I don't mention a great deal on here as a general subject... but I've been to some really great ones recently. It's so nice to have made lots of true friends through my blog, and by going to events I get to mingle more and I've met some really great people. It's also been brilliant to have brands and PR's make the effort to come up to the North East. I sometimes think it's easy for them to forget about us Northern bloggers, but when they do things especially for you, it's always such a nice feeling. Planning holidays has to get a mention here. I've been spending the past couple of weeks searching for places to go on holiday at the end of this month and in the Summer holidays and it's making me really excited to get away for a while, relax, have fun and spend some quality time as a family. It's quite hard to know where to go with Elodie, where she's not going to get bored, but I think we have had some pretty good ideas so far. I'd love to hear your suggestions if you have any though, as long as it's in the UK, I'm happy to consider anywhere! Since my last post, we've had the Easter half term, and I managed to plan in lots of fun things to do with Elodie. School holidays can be hard, because Elodie is wanting to do fun things every single day, and it can end up costing a fortune, so I was quite proud of how much I planned in for her this holiday! You can read all about the fun things we got up to in this blog post. One thing I just can't go without mentioning is that my beloved Newcastle United have been promoted to the Premiership again after winning the Championship. I'm not sure how many of you know, because I never really talk about it on my blog at all, but I am a huge football fan and Newcastle are my team... I'm a bit obsessed! To make things even better, I won some money with BettingTop10 when we became Champions, and considering I don't bet very often, I felt like it was my lucky day. Something I am really looking forward to is IMATS later this month. It's a lot earlier in the year this year, but I've been spending a lot of time with Ray arranging our travel, accommodation and most importantly the places we're going to be eating and the things we're planning on buying. I love our yearly trip to London, it's always a real highlight for me! And last but definitely not least, last week during an Instagram live, Ronan Keating read out my comment. Now to some (probably most) people reading this, you'll be thinking 'and what?! ', but for me, who has loved Ronan for a good 23 years - this is a big deal! The little teenage fan girl inside of me did a little happy dance when he read it! 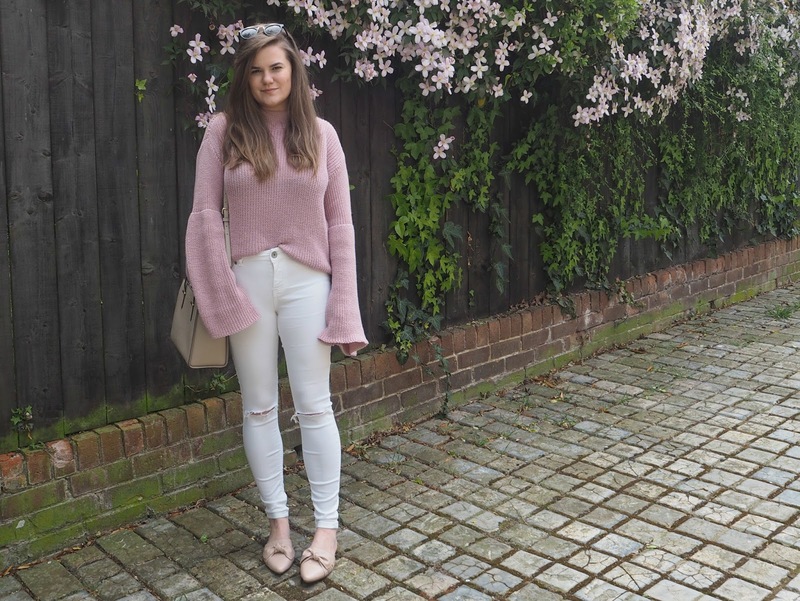 As a little bonus 'good thing', I'm so happy to have finally got another outfit post live on here. 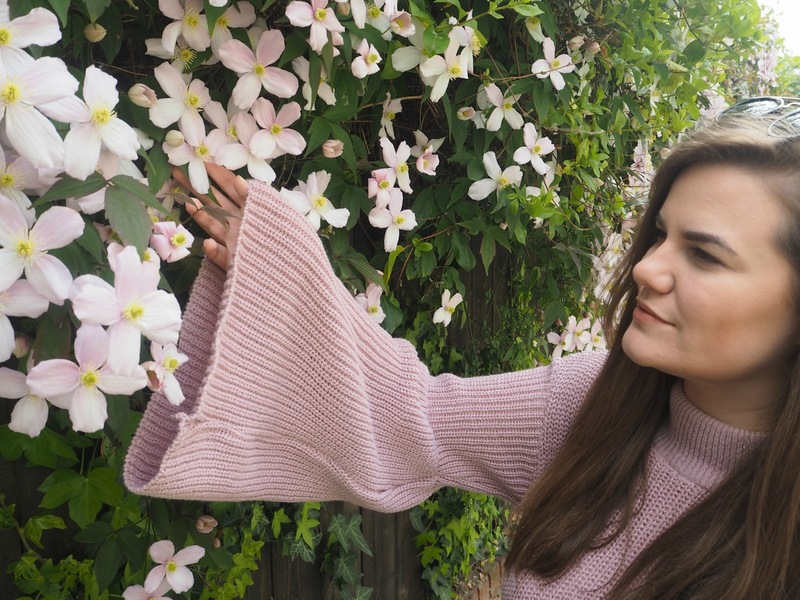 I'm wearing this jumper a little too often lately, but I just love the colour, the amazing sleeves and the fact that it's super comfy. Teamed with skinny jeans and my bow flats that I managed to find in my local Primark, I just can't get enough of this outfit. It's the perfect Spring time combination when the weathers nice. OMG I loved Ronan when I was younger, I literally wanted to marry him! 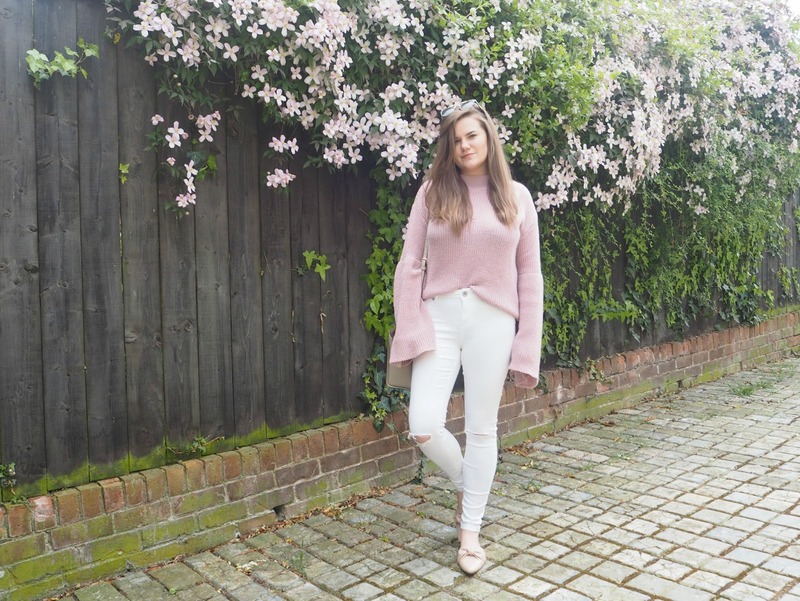 Lovely outfit - your blush tones are gorgeous!